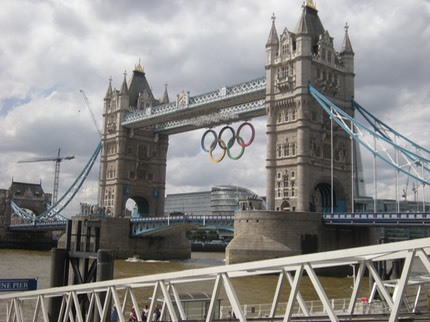 London 2012 has finished. The strangely track-suited groups wandering around the sights have disappeared. The countdown clock was placed in Trafalgar Square, about 200m from my London office, what seems like years ago and I have patiently watched the day count get lower and lower. Finally on Friday 27th July, the Day count hit “0” and the hours started ticking away to the opening ceremony. After the fantastic opening ceremony at Beijing, Britain was a bit concerned that our ceremony would be a bit second-class, but watching it on TV it was soon clear that the creative team had stepped right up and delivered something of very high quality and imagination. Denmark staged a “Viking Invasion” themed stand in the St. Katherine’s Dock area of London. I visited them on Saturday the 28th, it was 10am, and the beer was already flowing. The most popular thing though was the Danish breakfast with a long queue waiting for bacon rolls. 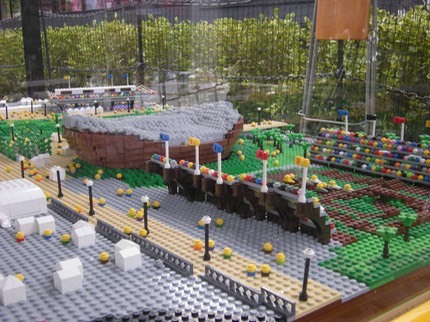 Not wishing to highlight national stereotypes too much, but Denmark had also built a Lego model of the Olympic Park!! 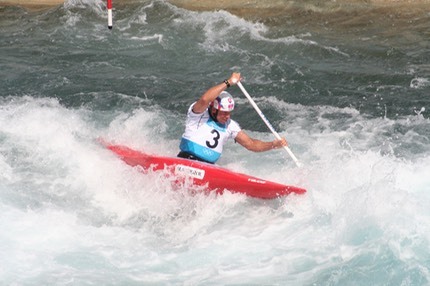 I was very fortunate to secure tickets to 4 of the events for London 2012 and my opening one was the canoe slalom at the new Lee Valley White Water Park, about 10 miles north of the Olympic Park. 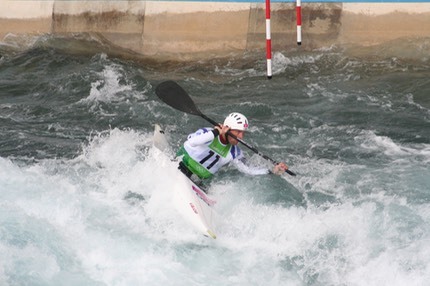 It’s a 250m course, dropping 5.5m overall, containing some 1m individual drops and over 20 gates for the paddlers to negotiate. We saw 2 events: C1 (one canoe, one paddle and one guy who kneels) and K1 (one Kayak, a double paddle and a guy who sits). These were both qualifying events so the guys were all fighting for places in the semi-finals. It was fast and furious, quite a lot of gates hit, a few capsizing and a few catastrophic runs. Both British guys progressed to the semi finals. 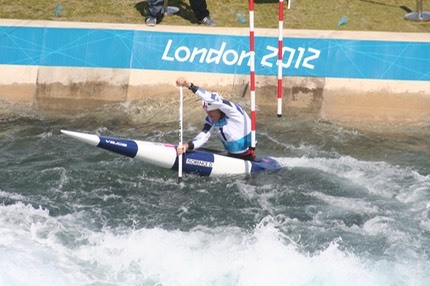 David Florence (D-Flo) C1. He did not win the C1 event but went on to win doubles silver with the guy in the next picture. Michal Martikan (Slovakia) is a living legend. Unbelievably successful over the years Martikan had a disastrous first run and ended up 17th out of 17, with only 12 places in the semis available. Second run, (no pressure!) and he blasted down the course in the fastest time of the day, 17th to 1st in 90 seconds. Being held on the hallowed turf at Lords (home of Cricket and not welcomed initially by the members) provided a historic background. I can’t say I’m a big fan of archery but thought it might be an interesting experience. Archery has quite a history in the UK so it wasn’t surprising to see whole groups of people who came dressed up as Robin Hood and Friar Tuck. Unbelievably, I found the event to be exciting, as each match was a head to head, first to 6 points with a single arrow “shoot-off” if the score was 5-5. South Korea was very strong in this event and was good for gold in many categories. A French archer had a very close call with a pigeon which flew across the target and narrowly missed being skewered on the Bulls-eye. The target was 70m away from the shooting line, with the centre of the target being about 8cm across. Nobody missed the target and the lowest score we saw was a 3. 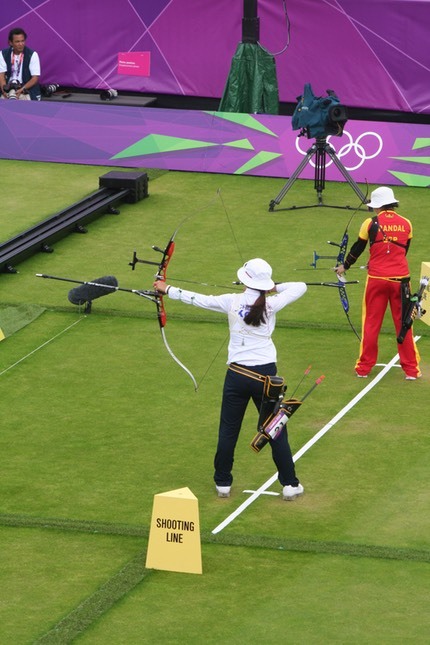 This female South Korean archer beat the Spanish champion and progressed almost to the final. One visit to the impressive new stadium was a “must have” on my Olympic list. 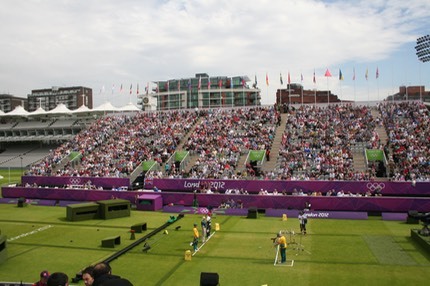 The Olympic Park was crowded with people as the venue contained not only the stadium but also the Velodrome, basketball hall, aquatic centre, hockey pitch and quite a bit more. Living quite locally, I knew this area of London before the regeneration and the results are very impressive. 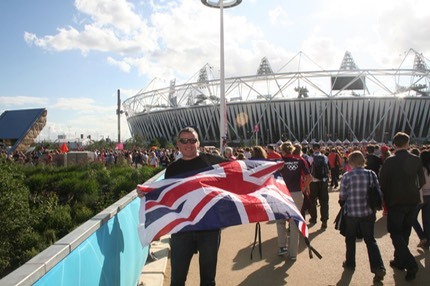 Here’s me flying the flag for Team GB, just before joining the queue for beer, which took about 20 minutes (more than enough time for a 5000m race to complete). Just before this photo London’s Mayor, Boris Johnson had arrived which delighted the crowd. 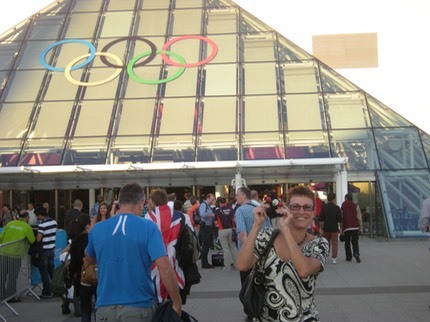 With the Olympic Flame at one end and me at the other the stadium was a great setting and a very lively atmosphere. 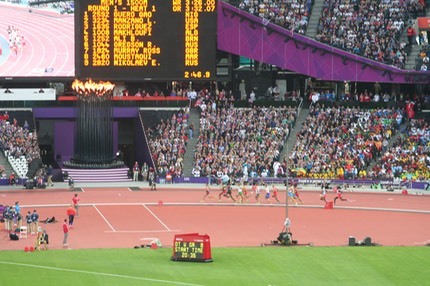 This was the first day of the Athletics and the highlights were expected to be Britain’s Jessica Ennis in the Heptathlon, and the Women’s 10,000m final. This photo was taken during the men’s 1500m qualifying. The women’s 100m qualifying also took place along with the men’s Shot Putt final where we saw the Polish athlete take gold. 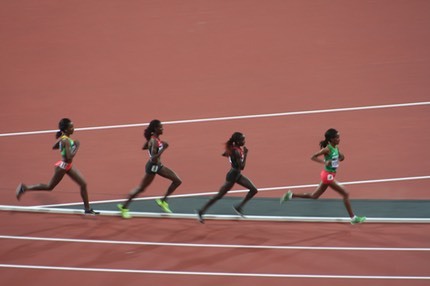 The Women’s 10,000m was the customary parade of East Africans (Kenyan and Ethiopian) and was a close event until the last lap when the lead Ethiopian athlete just sprinted for 400m to take an easy victory. I doubt I could have kept up with her for more than 20m. From a British perspective both our Long Jumpers qualified for the final (and indeed, Rutherford went on the win the Gold Medal). Jess was superb throwing a good shot, and setting a personal best in the 200m. Of course, we now know that she performed even better the next day to win Gold, but on our evening we were just happy that she had a solid first 4 events under her belt, and we hoped she got a good night’s sleep!. 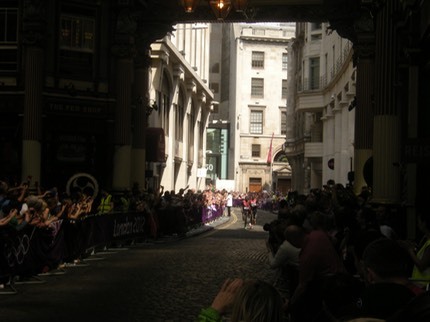 The support for the British athletes was phenomenal with every move cheered loudly. 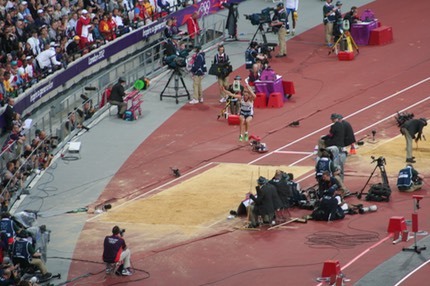 Funniest moment of the night was when one of the small remote control Minis cars that collected the discus went out of control and smashed into a fence. Nothing much happens on a marathon course until you hear the distant hum of a helicopter getting louder carrying the overhead TV cameras. Then, the support vehicles ensuring the route is clear. 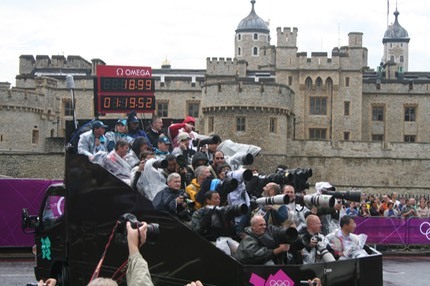 Finally you know the runners are close as the photographers and timing vehicles arrive. The photographers got a really loud cheer as they looked soaking wet and very cold. Next, it’s the runners. This is the lead group on the first circuit and this was a tricky turn on a slippery road. No records were going to be set today, and Britain’s best chance (Mara Yamauchi) had already dropped out. I departed for home after the second circuit as there was plenty more to watch on the TV. 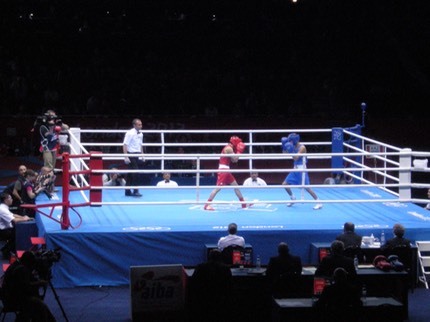 The Excel centre in Docklands was hosting a number of events, one of which was the boxing. The atmosphere was electric and both Amir Khan and Barry McGuigan were interviewed to the crowds delight. For the home crowd there was an excellent performance by the Irish fighter Paddy Barnes but disappointingly the British fighter, Tommy Stalker, lost by a point to a Mongolian so missed out on a guaranteed medal. It was non-stop action with 12 3 round fights in the session. 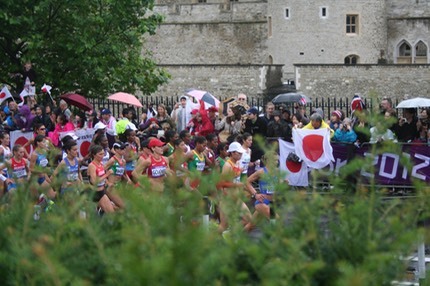 The last event of the Athletics was the men's marathon, run over the same course as the women's but with no rain, and a substantially bigger crowd. Hundreds of thousands of people lined the route with a continual cacophony of noise for every runner. The British guys put up a brave fight but were well down the field with an eventual victory for Uganda.